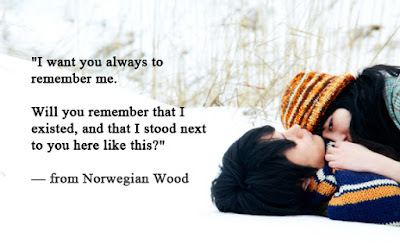 Reading ‘Norwegian Wood’ by Haruki Murakami is a very revealing experience. I encounter my own thoughts, views, and somewhere somehow suppressed opinions, wishes and teenage dreams. The growth and the development in Naoko and Watanabe’s relation is very memorable, has a nostalgic essence to it. Naoko is Kizuki’s girlfriend, who is Watanabe’s best friend. They are just acquaintances, at first, meeting up in double dates, but with Kizuki’s suicide, they are devastated and broken with only each other to care for as an integral part of their adolescence vanished along with Kizuki. They grow close with time, as years pass by, taking long walks in the meadow, through the streets of Tokyo, riding together in the metro, and discussing everything under the sun except Kizuki’s sudden death. On Naoko’s birthday when Watanabe mentions him, she snaps, crying violently. She leaves the town without notice. The story turns sad and melancholic at this point as Watanabe misses Naoko terribly, writes long letters and posts it to her hometown, witnesses student strikes at the university, becomes a loner without any friends, anyone for company. He roams the same streets alone, travels alone in the metro, hikes in the mountains alone. It’s sad and lonely, even though he is contemplating. Midori enters the scene like a breath of fresh air- chirpy and lively. She invites Watanabe to her bookshop and diligently cooks lunch for him. As they chat, watching the neighborhood fire, we realize she is broken too. Watanabe gets a letter from Naoko- she is staying at a quiet rehabilitation center, crudely a mental asylum, deep in the mountains, trying to heal from her sickness. Watanabe packs to visit her. It’s a beautiful place, with fresh air, a place to stay in the lap of nature and heal at your own pace. Reiko enters the scene, one of my favorite characters in the book- a supporting friend, who knows she’s ailing herself, and someone who still goes on living her life helping others recover, healing herself in the process while she knows she can’t go back to the normal world ever again. There are many conversations- and different stories within these conversations. Stories within stories. Every character has a different story. You never forget a single character. Nagasawa- the one who reads only those authors who have already been dead for about 30 years; Storm Trooper- the one with hilarious antics who does terrible jumping exercises at 6 in the morning. Almost all the characters are broken, and they know that they are sick, that they can go crazy without help. They are in a chronic depression, under the trauma of some deeply rooted wounds. Yes, this is a sad, sad, sad story- everyone dies. There're deaths and suicides everywhere. Happiness seems flimsy. It is tragic. Yet the characters hold on to the smallest hint of hope, the faintest light of faith, and go on trying to make things right. And then they die. It’s melancholic. I find myself rooting for Watanabe, Reiko, and Midori- the ones who choose life, even though I miss Naoko. The best thing about the narration is its simplicity. No complex sentences. Never verbose. It is when you close the book and sit back to think about what you read; you discover the extraordinariness of the story. Experiencing extraordinariness in simplicity is very new for me, and I am totally reveling in it. 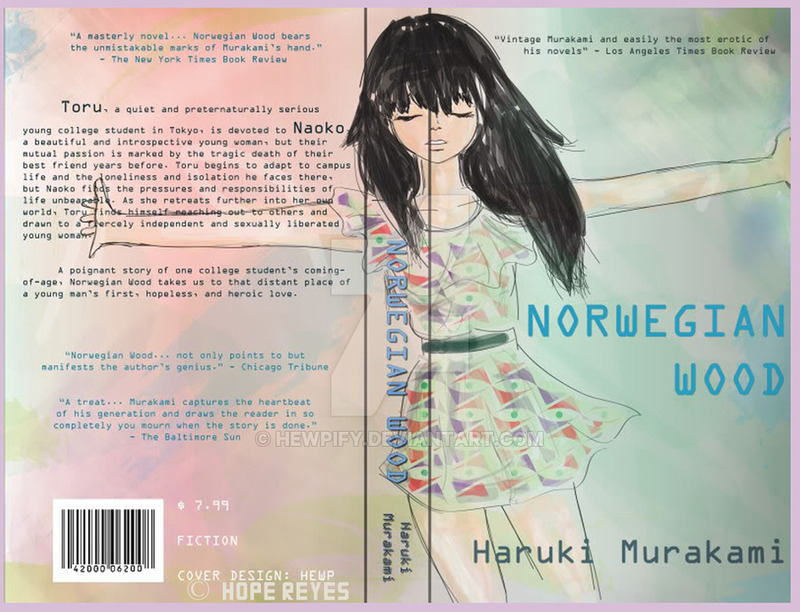 Haruki Murakami’s writings are places where ‘dreams, memories and realities often swap places’. He has been translated into over 40 different languages. 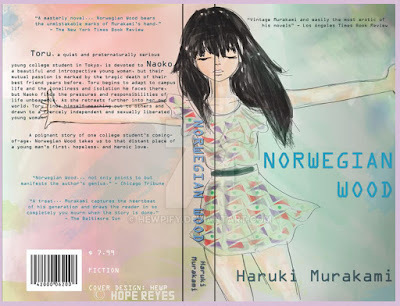 But while reading ‘Sputnik Sweetheart’ felt like someone was manipulating my thinking, twisting my understanding of how things normally are, playing with my brain; ‘Norwegian Wood’ was comparatively normal, not edging over anything surreal. It did have its share of symbols and metaphors but it didn’t do mind games. It had these philosophical ideas, meditative opinions, put forth at the oddest of places – that only and only Murakami can manage to use to play games with the readers’ psyche. The best way to read this book, so as to leave a lasting memory of the experience is to never judge. Never judge the story, the plot, the characters, or even the ending. Go with the flow. 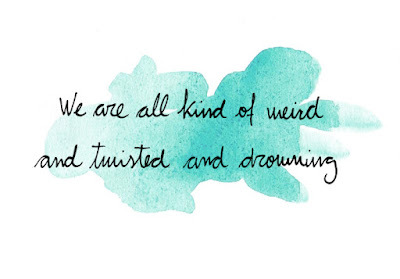 Revel in the weird, crazy, brokenness, the making and the unmaking of the tale. It is heavily emotional and it will stay with you.